This module takes the learner through the considerations for the river forecasting decisions associated with the remnants of Hurricane Ivan on 17-19 September, 2004 for the Susquehanna River system in Pennsylvania and New York. The module assists the learner with applying the concepts covered in the foundation topics of the Basic Hydrologic Sciences course. Some of the specific topics pertinent to this case are soil conditions, the impact of QPF on runoff, runoff models, runoff processes, routed flow and stage-discharge relationships. Observations of upstream conditions and comparisons to historic crests are also examined to assist with operational flood forecast decisions. The core foundation topics are recommended as a prerequisite since this module assumes some pre-existing knowledge of hydrologic principles. An interesting and worthwhile lesson. This was a very interesting module as well as informative and fun to do. I enjoyed it very much and learned much from it as well. I found this module to be very good. It was interesting to see the entire process from forecast to review. It represented well what was learned earlier in the course. This course was well planned, and it shows in the case study. After completing the module, it left me wanting to engage in another case study, seeing how it compares. 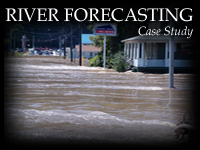 July 2014: Since the module's publication in 2007 there have been changes in the tools and models used within the NOAA River Forecast Centers. The material and exercises may be less relevant than they were at the time of publication.